There are so many things to do on the Big Island of Hawaii that you'll never be able to do them all in just one visit. We've chosen the top must-see attractions. Located 30 miles south of Hilo and about 96 miles and a two-hour drive from Kailua-Kona, Hawaii Volcanoes National Park encompasses 333,000 acres and stretches from sea level to the summit of the earth's most massive volcano, Mauna Loa, 13,677 feet above sea level. Included in the park is Kilauea, the world's most active volcano which has been in a constant state of eruption since January 2008. 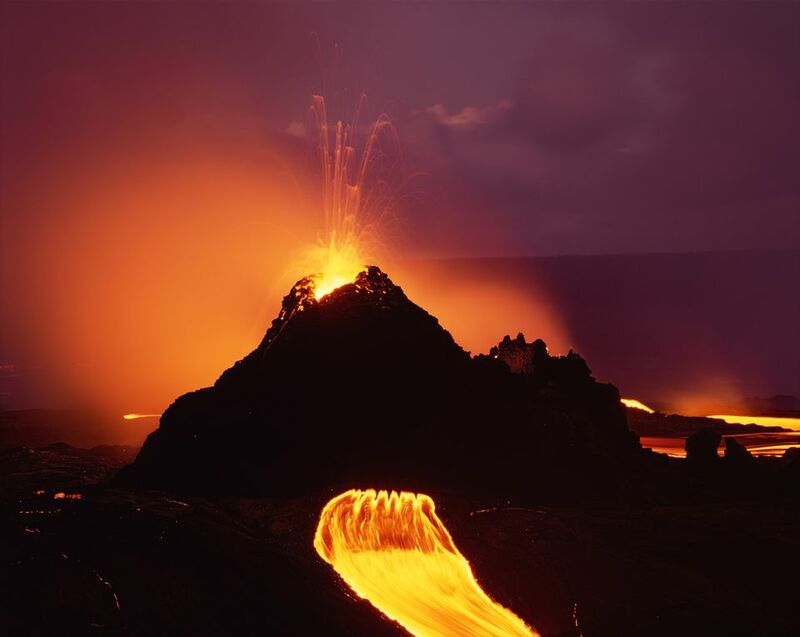 Depending on changing volcanic activity, you may have an opportunity to view an active lava flow either from within the park or from a viewing area outside the park operated by Hawaii County. You'll want to start your visit at the Kilauea Visitor Center where you can obtain information on current lava conditions. From there you can drive to the Steam Vents, the Thurston Lava Tube, Hawaiian Volcano Observatory and Jaggar Museum, and drive down Chain of Craters Road. Be sure to stop by the excellent Volcano Art Center. There are many companies that offer snorkel and scuba dive cruises on the Big Island of Hawaii, but our favorite is Fair Wind Big Island Ocean Guides. Fair Wind makes daily snorkel and scuba dive cruises (and whale watch cruises in season) along the South Kona Coast of the Big Island, departing from Keauhou Bay, just a 15-minute drive from Kailua Kona. Fair Wind operates two boats. The Fair Wind II is their older boat, having entered service in 1994. It's a 60-foot aluminum catamaran with covered deck, 15-foot water slide, high jump platform, and most of the amenities you'll find on other similar vessels in Hawaii. Their other vessel, the Hula Kai, is, quite frankly, unlike any other boat you've been on and, without question, the most modern boat sailing in Hawaii today. Fair Wind has definitely "kicked it up a notch" with the Hula Kai. There are several companies that offer trips to the summit of Mauna Kea for sunset, but our favorite is Hawaii Forest & Trail. Hawaii Forest & Trail is the brainchild of naturalist Rob Pacheco and his wife Cindy. On his first visit to the Big Island about 15 years ago, Pacheco quickly realized that the Hawaiian Islands contained diverse and unique ecosystems rivaling any place on earth. Pacheco decided to combine his passion with a vision: to share his passion for natural history with others and to help conserve Hawaii's endangered environment by educating them about it. It was a vision that fit well with the growing worldwide interest in eco-tourism. Soon after, and with the help of his wife Cindy, whom he had met in Kona, the idea for Hawaii Forest & Trail was born. Hawaii Forest & Trail offers a number of eco-adventures on the Big Island of Hawaii. We've been on several of them, and they are all excellent, but our favorite is their Mauna Kea Summit & Stars Adventure. For parents with children 16 years or older, there can be no better adventure than seeing the islands of Hawaii, the sunset, and the stars from the summit of the tallest mountain on earth, rising 32,000 feet from the ocean's floor. A trip to the summit of Mauna Kea is a long and somewhat physically demanding adventure but one well worth the trip. A group to the summit consists of about ten folks, usually of all ages. The guides are extremely knowledgeable and enthusiastic. They're a blend of naturalists, culturalists, geologists, and astronomers. The Waipi'o Valley is a mile wide at the coastline and almost six miles deep. Along the coast is a beautiful black sand beach often used by motion picture production companies. On both sides of the valley, there are cliffs reaching almost 2000 feet with hundreds of cascading waterfalls, including one of Hawaii's most celebrated waterfalls: Hi'ilawe. When you visit the Waipi'o Valley, you not only step into a place steeped in the history and culture of Hawaii, you also enter one of the most beautiful places on the face of the earth. As you travel through the valley, you see taro fields, lush tropical vegetation, and breadfruit, orange, and lime trees. Pink and white impatiens climb the cliff walls. You ride across streams and the shallow Waipi'o River. If you're lucky, you might even see wild horses. While you can hike into the valley on your own, we recommend taking a tour. For families with young children, Waipi'o Valley Wagon Tours is excellent. For families with teenagers or more adventurous adults, opt for a horseback ride with Na'alapa Stables. Parker Ranch is one of our nation's oldest and most historic ranches and is counted among the largest ranches in the United States, with nearly 250 horses and over 35,000 cattle. Founded in 1847 by John Parker, a New Englander who jumped ship on the Big Island and married the daughter of a member of the Hawaiian royalty, it is also the home of Hawaii's cowboys: the paniolo. Paniolos are a tough, hard-riding breed, who have worked Parker Ranch for six generations. The ranch's historic homes are only open to the public on special occasions, but hunting adventures and horseback rides with Cowboys of Hawaii are available. The Parker Ranch Store is also open to the public. Located about 22 miles south of Kailua-Kona off of Highway 11 on Highway 160, Pu'uhonua O Honaunau National Historical Park preserves the site where, up until the early 19th century, Hawaiians who broke a kapu (one of the ancient laws against the gods) could flee and avoid certain death. The 182-acre park has two major sections: the Palace Grounds, once the home of the ruling chief, and the Pu'uhonua O Honaunau, the Place of Refuge. Separating the two areas of the park is the Great Wall. Despite its overall size, the major sites are easily traversed on foot. The park includes a number of additional archaeological sites including temple platforms, royal fishponds, and the site of a coastal village. Utilizing many local artists and artisans with authentic and traditional tools, the National Park Service has worked very hard to restore the site to its appearance in the late 1700s. The Big Island of Hawaii is home to a number of excellent botanical gardens and arboretums: the Amy B.H. Greenwell Ethnobotanical Garden, Lava Tree State Park, Manuka State Wayside Park, Nani Mau Gardens, the Sadie Seymour Botanical Garden, and the World Botanical Garden, to name just a few. Our favorite is the Hawaii Tropical Botanical Garden. Located at Onomea Bay just north of Hilo off of Highway 19, the Hawaii Tropical Botanical Garden sits in a valley bordering the ocean. The Hawaii Tropical Botanical Garden was created through the efforts of Dan J. Lutkenhouse, who first encountered Onomea Valley in 1977 while vacationing with his wife, Pauline. Lutkenhouse purchased the 17-acre parcel for its seclusion and beauty but decided instead to establish a botanical garden to preserve the valley and its beauty forever. The garden is a non-profit enterprise "dedicated to providing a plant sanctuary, a living seed bank, and a study center for trees and plants of the tropical world, and to preserving the incredibly beautiful natural environment of Onomea Bay for generations to come." It is without question, one of the most beautiful places in Hawaii. As you wander the trails throughout the garden, you experience many different environments, including coconut groves, mango and monkeypod trees, palm jungles, and a giant fern tree forest. You pass waterfalls, streams and, at several points, you even reach the ocean. There are over 2,000 different species of plants in the garden. If it's Wednesday or Saturday, the place to be on Hawaii's Big Island is the Hilo Farmers Market on the corner of Mamo and Kamehameha Avenue in downtown Hilo. Popular with island visitors and even more popular with locals, the Hilo Farmers Market features over 100 local farmers and vendors selling a wide assortment of merchandise. While the market features some of Hawaii's best flowers, fruit, and vegetables, it also features a wonderful selection of food products, including coffee, cheese, honey, fresh baked goods, macadamia nuts, and even Big Island Kettle Corn. It's a wonderful place to sample the cuisine of the many ethnic groups that call the Big Island home. If you're looking for souvenirs or Hawaiiana to take home as a remembrance of your visit, there are plenty of vendors selling artwork, jewelry, Hawaiian quilts, clothing, soaps, candy, lotions, and even salad dressing. The market opens at dawn and remains open until the afternoon. Off of Highway 19 in North Kohala on Highway 270 near the port of Kawaihae is the Pu'ukohala Heiau National Historic Site. Pu'ukohala, or Hill of the Whale, Heiau was built by Kamehameha the Great in 1790-91. Kamehameha built this temple with the belief that if he did so, and dedicated it to his war god, he would prevail in his effort to conquer and unite all of Hawaii. This historic site, administered by the National Park Service, covers 77 acres and includes Pu'ukohala Heiau, Mailekini Heiau, and the John Young House. John Young was an English seaman who became a close adviser to King Kamehameha, teaching the Hawaiians to use cannons and firearms. Young was a grandfather to Queen Emma and one of only two white men buried in the Royal Mausoleum in the Nuuanu Valley on Oahu. A detailed map and information can be obtained at the Visitors' Center. The park is open daily from 7:45 a.m. to 5:00 p.m. The Puna area of the Big Island is an area that most visitors never see. Many drive through parts of it as they make their way from Hilo to Volcanoes National Park, but it's an area that deserves more attention. A company that specializes in showing visitors this less-traveled area is KapohoKine Adventures. KapohoKine is one of the few tour companies headquartered on the Hilo side of the Big Island and whose tours focus on the less well-known areas of the island. You do not, however, have to be staying on the Hilo side to enjoy their tours as pickups are also available in Kona and at locations on the Kohala Coast. In an effort to limit the environmental impact, tours with KapohoKine Adventures consist of much smaller groups than you'll see elsewhere in the islands. Tours are limited to seven guests in one of their luxury SUV's or ten guests in their VIP van. Smaller groups allow for much more interaction and personal attention between guests and the guide. KapohoKine is an eco-tour company, dedicated to maintaining a carbon-neutral footprint. Secrets of Puna is KapohoKine's signature tour and its most popular. The tour takes guests literally to the end of the Kapaho-Kalapana road where the 1990 lava flow of Kilauea overran and destroyed the town of Kalapana. Guests walk across the 1990 lava flows to see the new black sand beach at Kaimu. The tour then heads down the road and makes additional stops at MacKenzie State Park along the coast at the Malama-Ki Forest Reserve, where giant ironwood trees sit along a rocky windswept coastline. After passing by the more developed Isaac Hale Park, the tour heads inland for lunch at Puna Girl Farms, an active Macadamia nut farm where you'll get to meet and talk to the owner. Following lunch, the tour heads back to the coast for a stop at Ahalanui Park a.k.a. Pu'ala'a County Park, famous for its volcanically heated pool and then to the Cape Kumakahi Lighthouse, the most easterly point in Hawaii. The final stop in the Puna District is Lava Tree State Monument in the Nanawale Forest Reserve where lava flowed into a forest of 'O'hia trees, engulfing and incinerating the trees, but leaving cylindrical hollows, or tree molds, where lava solidified against them and the remaining lava flowed away. Often the original surface texture of the bark is preserved in the lava. What is left now appears to be trees made of lava. At the end of Highway 270 in North Kohala, past the quaint towns of Hawi and Kapa'au, you'll find the Pololu Valley. Much less well known than the Waipi'o Valley located 12 miles further south and east, the Pololu Valley is the first of five majestic valleys that stretch along the coast to the southeast. The Pololu Valley was once inhabited and home to several wet taro plantations. The plantations are long-abandoned and overgrown. Now Pololu is a popular, yet somewhat remote, destination for campers. Views of the coast, the black sand beach, and valley beyond are obstructed from the lookout. The best way to see all that this area of the Big Island has to offer is to hike down the four-mile trail to the valley floor 1000 feet below you. The hike is moderately difficult with a rocky path and very slippery footing following rain. The climb back up is strenuous. Allow yourself about two to three hours for the hike. The path takes you through groves of hau and ironwood trees, across marshland and the valley stream, which, depending on recent rainfall, may be easy to cross or you can set off from the shoreline by a sandbar. You'll then arrive at the valley's black sand beach, a favorite spot for family outings.